The increasing incidence of malignant pleural mesothelioma has demanded the attention of thoracic surgeons worldwide. Can radical surgery cure mesothelioma or add usefully to the length and quality of life for its victims? The MARS (Mesothelioma And Radical Surgery) trial is open and recruiting in Britain. If the trial proves feasible we will seek to make an international study. The purpose of this study was to ascertain the sensitivity and specificity of a series of mesothelial markers [including more recently investigated antigens such as h-caldesmon (h-CD) and D2-40] and, using receiver operating characteristic curve analysis, to identify a selected appropriate panel of antibodies for differentiating between epithelioid peritoneal mesothelioma and serous papillary carcinoma of the ovary. A substance that is being studied in the treatment of cancer. It belongs to the family of drugs called anti-infectives. A type of white blood cell derived from the thymus that participates in a variety of cell-mediated immune responses. There are 3 major types of T-cells T-helper (CD4), T-suppressor (CD8) and T-killer (cytotoxic T-lymphocytes or CTL). An enzyme that replaces DNA segments that would otherwise be truncated from chromosomes during cell division. Telomerase is found to be connected with sperm and blood cell production, whose mother cells consequently have no limited life span. Repeated DNA sequences that form the ends of each chromosome. During cell division, when the chromosomes are duplicated, some of these segments of repeated code break off. Once the telomeres are gone and only active genetic material forms the ends of the cell, the cell can no longer divide without destroying itself. The length of the telomeres therefore determines the lifespan of a cell. Human cells can divide approximately 60 times before exhausting their telomeres. A substance that can lead to the production of Foetal abnormalities. The male hormone, made primarily in the testes. It stimulates blood flow, growth in certain tissues, and the secondary sexual characteristics. In men with prostate cancer, it can also encourage growth of the tumor. Or tetracycline replacement agents such as doxycycline and minocycline, bleomycin, and talc appear to be the most effective agents. A prospective randomized study of videoassisted thoracoscopic pleurodesis with talc versus doxycycline in 33 patients with malignant pleural effusion suggests that talc provides superior short-term and long-term results. Talc appears to be the least expensive agent, at least when given as a slurry rather than by video-assisted thoracoscopic talc insufflation. Bleomycin, however, is the only agent approved by the Food and Drug Administration for the prevention of recurrent pleural effusions. Short hand for "T-helper cell type 1" which is a state of activated CD4+ T lymphocytes thought to be behind an immune response which is characterized by a cytokine profile slightly different from the body's normal response to viruses, funguses, etc, a profile which is strong in a cytokine called Interferon-gamma. Also see cellular immunity. Any of the T cells that when stimulated by a specific antigen release lymphokines that promote the activation and function of B cells and killer T cells. Also called T-helper cell. Also see humoral immunity. The Australia federal agency responsible for regulating the development, use and safety of drugs, medical devices, cosmetics and related products. A ratio of lethal dose (LD50) of the test compound in host cells over effective dose (ED50) of the test compound in diseased cells. The higher the ratio the mores specific the test compound is for the disease and the less toxicity that you would expect to see in treatments. Removal of fluid in the pleura through a needle. Thoracentesis involves percutaneous insertion of a needle for drainage of the effusion. Thoracentesis is not expected to permanently resolve the problem, but rather to alleviate symptoms that are acute and severe. The use of thoracentesis is also appropriate as a therapeutic trial to determine whether fluid drainage is beneficial when the relationship between symptoms and effusion is unclear. The use of a thin, lighted tube (called a thoracoscope) to examine the inside of the chest. An incision (cut) is made between two ribs to check inside the chest for signs of disease. A thoracoscope is a lighted tube that is inserted directly into the chest, between the ribs, to examine the lungs and heart. The procedure is called a thoracoscopy. A type of blood cell that facilitates normal blood clotting. An abnormally low number of platelets (thrombocytes). If the platelet count is too low, bleeding could occur. It can be a side effect of chemotherapy. A lymphoid organ in the upper chest cavity. The thymus is the site of T-cell differentiation, where the cells learn to recognize antigens. The thymus produces some 30 hormones or thymic factors (e.g., thymodulin, thymopentin) that are involved in the regulation of immune function. A ringing or rushing sound in the ears caused by physical or nerve damage to the hearing hair cells in the ear. The brain fills in the missing frequencies with white noise that can be very aggravating and distracting. It is a broad term that is applied to any group of cells that perform specific functions. Refers to airborne concentrations of substances and represents a condition under which it is believed that workers may be repeatedly exposed day-after-day without adverse health effects. Refers to the size of the Tumor N describes how far the cancer has spread to nearby Nodes M shows whether the cancer has spread (Metastasized) to other organs of the body. Letters or numbers after the T, N, and M give more details about each of these factors. To make this information somewhat clearer, the TNM descriptions can be grouped together into a simpler set of stages, labeled with Roman numerals. In general, the lower the number, the less the cancer has spread. A higher number means a more serious cancer. A form of Intensity Modulated Radiation Therapy that integrates a CT Scan in the treatment to better target tumors and reduce radiation to healthy tissue. The scan allows greater precision for the radiation treatment by pinpointing tumor mass. One of two small immune system glands, made up of lymphoid tissue, located at the back of the throat. Pertaining to the surface of the skin; a medication applied to the skin. Chemical or physical (for example, asbestos) agents that can cause harmful effects to living organisms. An opportunistic infection caused by the microscopic parasite Toxoplasma gondii, found in raw or undercooked meat and cat feces. The disease often affects the brain (toxoplasmic encephalitis). The "windpipe." The trachea connects the larynx (voice box) with the bronchi and serves as the main passage for air into the lungs. A surgical opening through the trachea in the neck to provide an artificial airway. Pertaining to a chromosome or an organism into which genes from another individual have been inserted. The use of sound waves to create a picture of the prostate on a screen to help detect tumors. A surgical procedure to remove abnormal tissue from the bladder. The technique involves the insertion of an instrument called a cytoscope into the bladder through the urethra, and the tumor is removed through it. A physician who provides care to the patient while in the hospital, and usually works at the hospital or comes in as a specialist. Therapy, the act of remediation of a health problem, which could include surgery, chemotherapy, counseling, pharmacotherapy and psychotherapy. One of the six varying forms of asbestos, characterized by translucent bright- to gray-green tough interlocking fibers which are flexible and elastic. The examination of facts and law presided over by a judge with authority to hear the matter. 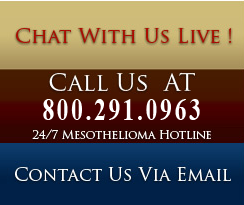 Mesothelioma Asbestos trial. A psychotropic agent that elevates the mood and prevents or alleviates psychological depression, and which may be used as an adjuvant analgesic to relieve the pain of peripheral neuropathy. Therapy of malignant pleural mesothelioma involving extrapleural pneumonectomy (removal of the lung) followed by adjuvant chemotherapy and radiotherapy. Trimodality therapy appears to help prolong life, though initial surgery does carry significant risks. An affinity for or the tendency to move toward a specific target; the attraction of a virus or other microorganism to a particular type of cell or host tissue (e.g., M-tropic HIV preferentially infects macrophages). A type of T-cell that bears the CD8 surface marker and helps to regulate the immune response. TLC total lung capacity, a measure of lung function. Refers to strains of HIV that preferentially infect T-lymphocytes. Inflammation of the pleura associated with tuberculosis. The "tubes" are medically known as the Fallopian tubes. There are two Fallopian tubes, one on each side, which transport the egg from the ovary to the uterus (the womb). The Fallopian tubes have small hair-like projections called cilia on the cells of the lining. An abnormal mass of tissue. Tumors are a classic sign of inflammation, and can be benign or malignant (cancerous). There are dozens of different types of tumors. Their names usually reflect the kind of tissue they arise in, and may also tell you something about their shape or how they grow. For example, a medulloblastoma is a tumor that arises from embryonic cells (a blastoma) in the inner part of the brain (the medulla). Diagnosis depends on the type and location of the tumor. Tumor marker tests and imaging may be used; some tumors can be seen (for example, tumors on the exterior of the skin) or felt (palpated with the hands). Mesothelioma Tumor. The size of the tumor or number of abnormal cells in the organ or tissue. A cytokine, produced by activated monocytes and macrophages, that can destroy tumors. Mesothelial tissue surrounding the female reproductive organs. Mesothelial tissue surrounding the male reproductive organs.